Quick post today as I go out to enjoy my last full day at Walt Disney World. I took this photo of Cinderella Castle in the Magic Kingdom from the Ticket and Transportation Center near the Ferryboat dock. The Dream lights on the castle make it look like it is made out of ice. Cinderella Castle in the Magic Kingdom at Walt Disney World decked out in dream light. Nikon D700/28-300VR, 3s, f/8, ISO 200, EV -1.0, 300mm focal length, tripod. 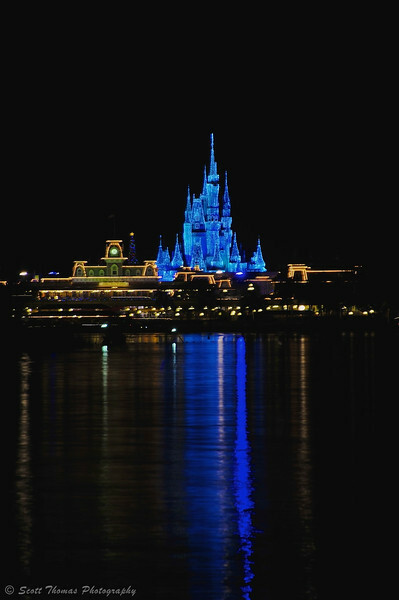 This entry was posted in Weekly View and tagged 28-300mm, cinderella castle, dream, florida, ice, lights, long exposure, magic kingdom, night, nikon D700, orlando, reflection, vr, walt disney world. Bookmark the permalink. You’re a BIG KID at heart ! That is a wonderful way to be. Enjoy your time in the Magic Kingdom. My family and friends would agree with you on that assessment. I do have a fun time at WDW. Christmas time is another Big Kid time of year for me, too. Oh, that does not begin to describe the rest of that evening. I photographed the fireworks show from this location. Do you think anyone would miss me if I disappeared for a few days in the middle of the Christmas season? Well, then take me with you both! LOL I never get tired of the place and thanks! Oh, now, you flatter me, girl! I was at this location by accident before but what I saw was not as pretty as your image. I do love the reflection in the water. To get this kind of photo as colorful and sharp as this, you have to use a tripod and a telephoto lens. I tried it hand held before and it just does not work very well. Glad you liked the reflection!